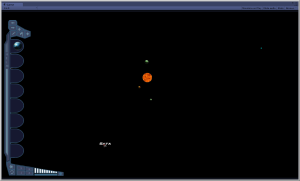 Normal space is about 80% complete, radar is active, enemy ships are displayed and moving as expected, planets are displayed in their proper place, the radial menu is locking to the selected planet or ship. Another few days and I should have the helm menu active and the ability to leave the system. If all keeps going this well we should be back on schedule by Dec 1st. If it looks a little small, I am playing with the sizes, it has a ways to go but re sizing is easy.